Have fun reinforcing various grammar concepts with your child by playing a fun, FREE Taboo Grammar Game. It is the perfect way to review parts of speech, punctuation symbols, parts of a sentence, and more! Play in a group or one-on-one with your early elementary aged kids. I created a similar game for Big Brother when we were rowing the book, Daniel’s Duck. Our curriculum guide suggested talking about emotions so I made up this simple Guess That Emotion Game. The game was inspired by the game, TABOO! where you are to give the other player clues to a word without saying the word, and the other player gets a point if they correctly guess what the word is. 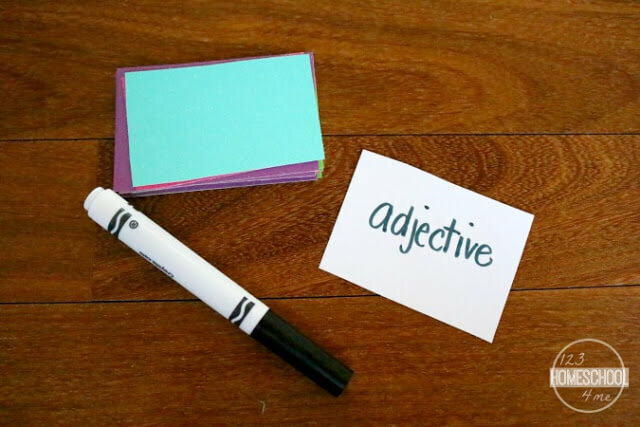 The game was a BIG hit, and since we’ve just finished a unit in our grammar curriculum going over several concepts such as nouns, verbs, adjectives, subject, predicate, punctuation marks, and more– I decided to set up a new TABOO! inspired game involving…. you guessed it– grammar concepts! Simply print cards in the free download below. I suggest using white or colored cardstock for durability. Decides who goes first and without looking at the card, have him/her place it near their forehead so that you can see the card. Your job is to describe the word on the card, without saying the word. 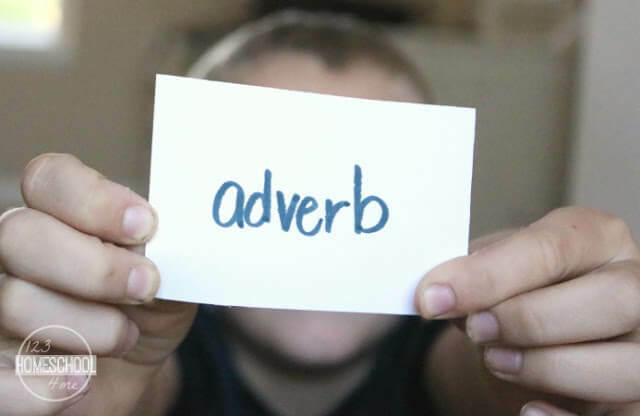 For instance, if the other player is holding up the word, “Verb” you may say, “jump, run, swim.” If the person correctly guesses the grammar concept, they get a point. Take turns going back and forth or see who can get the most points in 1 minute. No matter who wins or what you choose to review, playing this game is a sure-fire way to make grammar much more fun!